The year was 1950. I had always heard talk about the friar with the stigmata and I wanted to go and see him. I am a Catholic but as regards my faith, I am not an emotional character nor am I easily roused to enthusiasm. My visit to San Giovanni Rotondo was not so much one of faith but rather one of curiosity. 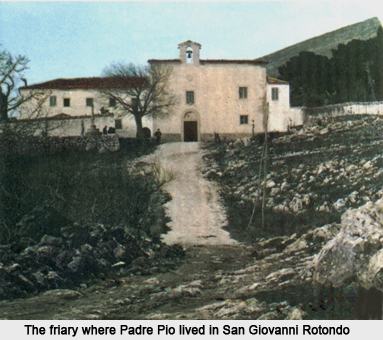 I knew also that the friary was a continual goal of pilgrims who came from all over the world, so in the hope of being able to see and observe Padre Pio more closely and carefully, I made the trip. It was almost midday when I arrived. In the friary square I noticed a booth where a Capuchin friar was making the bookings of those who wanted to go to confession to Padre Pio. I too booked and was told that the wait would be about one week. I was curious to see for myself this extraordinary friar whom I had seen so many times in newspapers and magazines. I went into the church and waited in the sacristy but the crowds were so great that we were squashed one on top of the other. When Padre Pio entered the sacristy, I was only just able to see him. He was accompanied by two friars to protect him from the crowd, and they were only just able to get him to the confessional. Around 5:00 p.m., Padre Pio came down for Vespers, and this time I was able to observe him well and from close up. I received such an impression that, still to this day, after having got to know him very well from many visits, am unable to describe. He was a figure, dare I say, indefinable. He was fatherly, austere, sullen, happy, sarcastic, ironic. His eyes scrutinized you as if they wanted to penetrate your very flesh and they forced you to lower your eyes. That day I saw something which seemed to me rather strange. When Padre Pio entered the sacristy, he politely greeted a man by my side, who as soon as he saw Padre Pio, knelt and kissed his hand. Then Padre Pio washed his fingers that protruded from his brown mittens because he was going to celebrate Vespers. The man he had spoken to handed him a white handkerchief to dry his hands. When Padre Pio was going into the church, I saw this man fold the handkerchief and put it in his wallet. Seeing my curiosity, he said to me, “As soon as Vespers is over I will explain to you why I did that.” I thanked him and we went into the church. “I have been coming to San Giovanni Rotondo every week for the last six months” the man told me, “and shall continue to do so until Padre Pio’s hospital is finished, and then I will never leave again. I live in Rome where I practice as a doctor. My parents are no longer alive. My father was a doctor like myself and with great humanity. He taught me the importance of unconditionally helping others who are suffering whether materially or morally. Like myself, my father did not have any religious faith but my mother and my sister were fervent Catholics. I always admired my sister’s discretion of never discussing religion with me. About eight months ago, Massimo, my sister’s son, a student in his third year of medicine, began to complain of strong pains in his head. I prescribed some pain killers for him but the pain would not go away. I had him undergo many tests, including a brain scan, and we discovered to our horror that he had a tumor on his brain. Shaken by this terrible diagnosis, I took Massimo first to Switzerland where I knew an excellent doctor who unfortunately confirmed the diagnosis. Still not happy, I took him to London to a great luminary of medicine, who after having made a few tests and an x-ray, told me that Massimo had no more than three of four months to live. He added that it was impossible to operate because to remove the tumor would mean cutting into the brain and this would cause total paralysis and then very probably, death. My nephew was forced to abandon his studies. He became very weak and had to spend most of his time in bed. Little by little, he began to lose his sight as the tumor pressed on his optic nerve. I went to see him every day and tried to raise his morale. As my nephew’s condition grew worse, my sister began to despair. I had to go away to a medical conference in Milan and during my absence my nephew got suddenly worse with insupportable, stabbing pains. My sister called a colleague of mine, an excellent doctor who was young and very religious. After he had seen the boy, the x-rays and tests, he at once understood the gravity of the case. He told my sister that no better medicines existed than those already perscribed and added that this was a desperate case before which science was powerless. He said that it was necessary to hope for a miracle. He also said that he always saw my sister and her husband in church on Sunday and that she should pray because her son needed prayers more than medicines. One evening when I went to visit Massimo, I witnessed a scene that, at the time, I considered to be terrible fanaticism. At my sister’s home there were gathered about ten family friends. All of them were very respectable people whom I admired, however all were fanatical Catholics. The most fanatical one of all was a retired military colonel. Even so, he was a dear person. He was a close friend of the family and also a spiritual son of Padre Pio. They had formed a circle in Massimo’s bedroom and, in the center, kneeling on a cushion, they had placed the poor boy. To hold him up, they had to put a chair next to him. They were all praying the Rosary. Seeing this, I went into the studio cursing at my sister and her husband who, because of selfishness would not even let their son die in peace. I continued to curse at them but on hearing me they raised their voices and continued their prayers. The Rosary ended and the colonel said, ” Now we will say a special prayer to Padre Pio so that he intercede with our Lord and assist me in what I am about to do. I have a handkerchief with which, that holy friar, a while ago, dried his hands. With this handkerchief, I will cover the head of Massimo and God will do the rest. Hearing these words, I entered the room like a madman. I said to the colonel, who in that moment was about to place the handkerchief on the boy’s head, that if it wasn’t for the respect I had for him and his age, I would have beaten him up and Padre Pio as well. I had not even finished the last word when Massimo cried out, “Mother, father, I can see!” and he staggered to his feet. I took him under his arms and placed him on his bed. With all the color drained from my face and my energy drained from my body, I collapsed in a chair. After awhile, Massimo, who had not eaten for several days, asked for something to eat. My sister, crying with joy, rushed to prepare some food for him. The days went by and the boy got better and better before our very eyes. We took him back to the doctor where all the x-rays and tests were repeated. Not a sign of the tumor on his brain could be found. In my soul there was no longer any trace of atheism. The change to the Christian creed was so rapid and radical that I was not even aware of it. It seemed as if I had always been a Catholic. About a month after this extraordinary event, one night in a dream, I heard someone call me by my baptismal name. I woke up with a start. I was still troubled by the extraordinary events that had taken place and I was frightened. I thought I had heard the voice of my sister’s husband. Instead after an instant, and I was perfectly awake, the same voice, which however was not of my sister’s husband, said to me, “Do not forget I am waiting for you because you promised to beat me up!” I understood at once then that it was Padre Pio. That same night (it must have been about 2:00 am) I got dressed quickly and took a taxi to the train station. This was the beautiful story the doctor related to me during my first visit to San Giovanni Rotondo. I do have some experiences of my own to relate as to my meeting with Padre Pio. The crowds were so great at the friary that whoever wanted to go to confession to Padre Pio could do so only by booking. I did this and was told that it would be a wait of one week. When my turn for confession finally came up, I was a little uneasy, especially after hearing the story that the doctor had told me. The first thing I experienced when I was in Padre Pio’s presence, was a marvelous perfume which seemed to me to be the fragrance of violets. The perfume was so strong that it almost made me faint. However, after my confession, I asked for his blessing for myself and all of my family. He placed his hands on my head and said, “This is also for your family. Young man, always be good.” I kissed his hand and left. On several other occasions I went to San Giovanni Rotondo with my wife. Often we went to confession to Padre Pio. Both of us experienced a beautiful perfume when we were near him. I can say that I am truly devoted to Padre Pio and to his heroic and exceptional life.